Throughout his ministry on earth, Jesus cared for the sick. We believe that he continues this today, through the Sacrament of the Anointing of the Sick. This is not the "Last Rites" (though it is often confused with them). It is a prayer for healing - which may be physical, spiritual, mental or emotional, depending on God's grace. Any Catholic who is gravely ill, or facing serious surgery, or even struggling with mental illness, can and should receive this Sacrament, possibly many times, so that Jesus may help them in time of need. If you or a member of your family is in hospital, you should ask the ward or home staff to contact the chaplain or priest on call to celebrate this sacrament. The Lord Jesus himself showed great concern for the bodily and spiritual welfare of the sick, and commanded his followers to do likewise. This is clear from the Gospels. And above all from the existence of the Sacrament of Anointing, which he instituted, and which is made known in the letter of Saint James. Since then the Church has never ceased to celebrate this sacrament for its members by the anointing and prayer of its priests, commending those who are ill to the suffering and glorified Lord, that he may raise them up and save them. Those who are seriously ill need the special help of Gods grace in this time of anxiety, lest they be broken in spirit and, under the pressure of temptation, are perhaps weakened in their faith. This is why, through the Sacrament of the Anointing of the Sick, Christ strengthens the faithful who are afflicted by illness, providing them with the strongest means of support. To receive the sacrament, please contact the Church. It is wrong to talk about this sacrament as the Last Rites. To do so naturally discourages people from celebrating this sacrament when it is needed, because it is associated with death and delayed. The Anointing of the Sick is a Sacrament of healing, hope and life, not about our departure from the world. Some people believe that you must receive this sacrament before death, and that failure to do so somehow puts you at a disadvantage before God. This is simply not true. 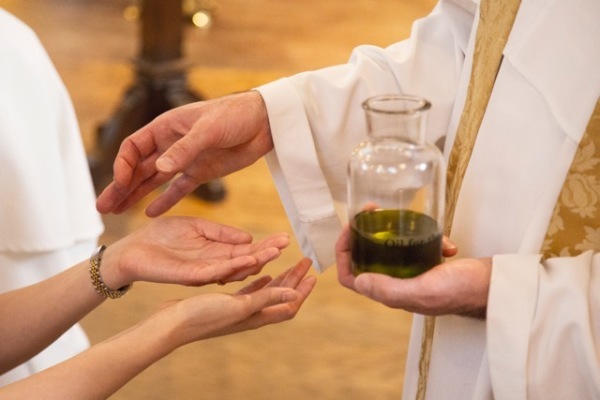 Just as Jesus laid his hands on people and gave them healing and hope, so this sacrament is to be given when possible in the first stages of serious illness, in order to bring healing and life to the sick person. All Catholics have an obligation to know about this Sacrament, to be aware of when is the right time to celebrate it, and to understand what gifts of grace it brings to the sick person. The Church states the following: Great care and concern should be taken to see that those of the faithful whose health is seriously impaired by sickness or old age receive this sacrament. We are also told that this should happen as soon as the sickness becomes serious. A person may be anointed many timesas often as is necessary for their spiritual life. A sick person may anointed before surgery, whenever a serious illness is the reason for the surgery. Elderly people are to be anointed if they have become notably weakened, even though no serious illness is present. Sick children are to be anointed if they have sufficient use of reason to be strengthened by this sacrament. The faithful should be educated to ask for the sacrament of anointing and, as soon as the right time comes, to receive it with full faith and devotion. They should not follow the wrongful practice of delaying the reception of the sacrament. All who care for the sick should be taught the meaning and purpose of the sacrament. The first grace of anointing is strengthening, peace and courage to overcome the difficulties that go with the condition of serious illness or the frailty of old age. The anointing also brings forgiveness for sins, and an assistance from the Lord, to lead the sick person to healing of the soul and also of the body, if such is Gods will. None of us can say what grace God will giveit will depend on our need, and Gods vision for us. For some it may be strength, acceptance and hope in a time of serious illness. For some it may be physical healing. For some, it may be the grace to pass from the suffering and pain of illness into new life with God. The sacrament is not magic, but is an indefinable gift of grace from God: it will achieve its purpose. While the Anointing of the Sick is not to be seen as a last rite, the Church does have a sacrament of departing; this is called Viaticum, which literally means, food for the journey. When in danger of death, a baptized Catholic must, if possible, seek to receive Holy Communion: this will be a special help to them, for they will be asked to remember what Jesus said: Those who eat my flesh and drink my blood have eternal life, and I will raise them up on the last day. For this reason, this rite should (where possible) not be delayed to a point where a person is unable to receive Holy Communion. There is a special rite for this Last Communion, which includes a Renewal of the Vows of Baptism, and the celebration of the Sacrament of Penance, and a priest may also give the Apostolic Pardon. If you are going in for a serious operation, you should not be afraid of celebrating this sacrament - it is about help and healing! It can be celebrated at home or in Church. Just have a word. In the case of emergency, if you cannot contact the Parish Priest please get in touch with a neighbouring parish, or (in absolute danger of death situations) contact Fairfield Hospital for the priest on call. You can phone during Office Hours on 0161 724 1765 or, if it's more convenient, use this email form to make your first appointment. Make sure you put your name, email address and "Anointing of the SIck" as the subject.